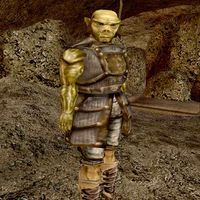 Lugrub gro-Ogdum is an aggressive Orc warrior and Trooper of the Imperial Legion located in the Lower mines in Gnisis Eggmine. When you walk into the lower level, he warns that he will attack you after the count of 10, and does. As it turns out, he is the murderer of the recently-deceased victim, Mansilamat Vabdas, who was Widow Vabdas' husband. A clue can be found lower down in the mine. In actuality, Lugrub is there to stop you from discovering the truth behind the murder. Lugrub wears an Imperial chain cuirass with matching greaves, netch leather boots, and a pair of common pants. In combat, he relies on an iron war axe. Like all Orcs, he has a natural resistance to magicka, and can boost his health, fatigue and attack for short periods, at the cost of agility; otherwise he knows no spells. "Darius says you can be here, so it's okay with me." This page was last modified on 10 October 2015, at 18:09.